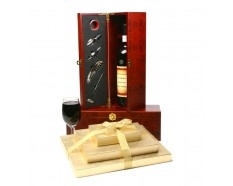 Triple Tiered Gourmet Gold Chocolate Tower perfectly paired with a classic Cabernet Sauvignon nestled in a mahogany case with a 5 piece stainless steel wine connoisseur tool set. Luxurious 3 Tier Signature Gold Gift Tower includes a Rich & Exquisite Gourmet Assortment of Creamy Milk & Dark Chocolates, Caramels, Meltaways, English Butter Toffee, Chocolate Covered Pretzels, Peanut Butter Cups & Pecan Caramel Turtles. During the months of May - August, (because of warm weather), this item will be substituted for a chocolate product which is equal in value.